I was actually down to 233 pounds at one point this week, which freaked me out a little (being 5 pounds down and 3 days to go to weigh-in), so I increased my calories a bit towards the end of the week just to make sure I wasn’t way under-eating. Then hubby brought home Krispy Kreme yesterday, and that totally didn’t help. XD But definitely not complaining at all. I was pretty laid-back about my eating this week, and also had an event on Tuesday where I ate ALL THE CAKE. But it was, like, mini-sampler bites (of various different types) so not as horrible as it seems,. Which is probably why I managed to maintain this week, rather than gaining anything. So, overall I’m pretty happy. I mean, obviously, I’m not stopping now, but I know I have an event on Tuesday that will have me eating lots of yummy, but awfully high calorie foods. But at least I’ll still have a few more weeks to work it back out. It’s that time of the month and the cravings are intense. The fact that I didn’t actually gain anything this week is somewhat of a miracle, so definitely not going to complain about not losing. Honestly was a little surprised that I dropped as much as I did this week (actually saw the underside of 240 at one point even). Though a lot of it is probably still the water weight from nomming as much as I did last month. So not going to complain, that’s for sure. 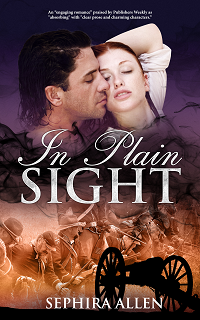 In totally off-topic news… I released my debut novel, In Plain Sight, this week. It’s available on Amazon, but you can read all about it here.